Ouch…what a lousy coincidence! I had scheduled to complete and publish this post on March 31st, the night before Holy Thursday but lightning chose to kiss our iMac a few hours earlier. Just got back our computer this evening with the mother board replaced! Missing in action for three long weeks…really a drag, fortunately I had lots of gardening jobs to keep me busy! Hence this belated post that was drafted a week before Easter Sunday, but only able to be finished today…. The season of Lent 2010 lasting 40 days (excluding Sundays) that began on Ash Wednesday, February 17 and will end on Holy Saturday, April 3 the day before Easter Sunday, gives me a special period to deepen my relationship with God and experience His outpouring love more profoundly through devoting more time to prayers, repentance and acts of mercy. Since the Holy Week started on Palm Sunday, I’ve taken the opportunity to savour this time to reflect further on the Prodigal Son Retreat that was held from March 19-21, 2010. It was 3D2N non live-in Lenten Retreat, organized by the Family Life Ministry of the Church of St. Francis of Assisi and held at The Little Sisters of the Poor – St Francis Xavier Home for the Elderly in Cheras, Kuala Lumpur. I praise and thank our Heavenly Father for having drawn my beloved John and I, as well as about 126 more retreatants to experience His unconditional love in The Story of Homecoming, Affirmation and Reconciliation as presented by Our Lord Jesus Christ in His parable, The Prodigal Son, in The Gospel according to St. Luke, Chapter 15:11-32. Our retreat directors were Most Rev. John Ha (Archbishop of Kuching), Dr. Jeffrey Goh (Lay Theologian and Barrister-at-Law) and his wife, Angie. With charisma and dynamic spirituality, they led and guided us through talks and spiritual reflections on the Younger Son, the Elder Son and the Father as portrayed in the parable of The Prodigal Son, based on Henri Nouwen’s book titled ‘The Return of the Prodigal Son’ and in the light of Rembrandt’s famous 17th century (1669) painting with the same title. And, drew us too to reflect on how we can identify with each of the 3 main characters in the Homecoming story, during our personal prayer times and silent reflections. Just sharing some brief recollection of the various talks, reflections and events during the retreat and some personal reflections. My purpose is to keep a record here that I may revisit easily to ponder afresh God’s calling to return home to Him where I belong. Fully aware too that often times, I get preoccupied with worldly matters and will forget about the precious enlightenment acquired from the retreat sooner than I’d want to, this is probably the best place to maintain it. It was the first time that I encountered Rembrandt’s magnificent painting of The Return of the Prodigal Son and marveling it with the guidance of the Retreat Directors was indeed absolutely awe-inspiring and most enlightening in the light of the parable. However, being led to connect myself with the identities of the two sons became even more disturbing and challenging when I see and acknowledge myself to be probably a worst sinner than them and in great need of God’s unreserved grace and mercy. Demanded his father for his share of his father’s estate – in Jewish culture, it’s tantamount to wishing his father dead; desirous of cutting off family ties, values and community by leaving home for a distant country, he can be described as arrogant, bold, boastful, insolent, rebellious, rude, ungrateful, unkind, etc. Sold his property and squandered his money on debauchery, then hungry and penniless, he finally came to his senses and returns home, hoping to ask his father to hire him as a servant, imagining it impossible that his father could welcome him home as a son. However, the reverse happened – filled with much love, the father ran out to welcome and affirmed him as his son with the best robe, ring and shoes, and killed the prize calf to celebrate his safe return with a grand feast. We’re like prodigal sons/daughters many times a day whenever spiritually separated from God; allowing voices of dark emotions such as anger, resentment, jealousy, envy, etc. to dominate; being tempted by other voices – pursuit of success, fame and money for self-worth and self-gratification; preoccupied and addicted to worldly matters, disregarding God’s presence; having no sense of wrongdoing or guilt; refusing to be repentant or not convinced in God’s desire to forgive. We as children of God have the inheritance; must have the spirit of gratitude and thanksgiving, and share gifts of our time, talent and treasures; to review our lives, admit failures and willing to reform; be penitent, go for confessions and be reconciled with our Heavenly Father. Did he leave home? Yes? Stayed at home, yet seemingly lost as his heart had wandered so far away from home. Obediently, he had fulfilled his duties and obligations, but did not feel as a son, instead as a servant. In Rembrandt’s painting, he is seen to be very cold, withdrawn, without joy and unwelcoming, just as a bystander, watching the reunion at a distance. Even his icy retort to his father in the parable, seemingly implied that he excluded himself as the son and the elder brother. He was imprisoned in his own resentment and frustrations, having a self-righteous attitude with growing anger and bitterness. He judged his irresponsible sibling as unworthy and his father as being unjust and favoured the other, never rewarding him for his obedience, hard work and righteousness. He was so angry and refused to enter the home to join in with the homecoming celebration. He loves both sons regardless and want both to come home. The elder son was urged to accept his unique place in his father’s heart and to join in the joyful celebration. Did the elder son repent? Well, there’s no mention of his response to his father’s invitation! Left to us to create the conclusion. God’s love, grace and mercy is always available for us. It’s unconditional, unlimited and unreserved. GOD ALMIGHTY REACHES OUT TO ALL irrespective of our sinfulness. We have to let go of self-righteousness, rivalry, suspicions, resentment, bitterness, jealousy, etc. – never allow these dark feelings to fester in our hearts and be deprived of peace, joy and love. Have trust in God’s all-forgiving love. Be humble, repent and be forgiven. Be grateful. 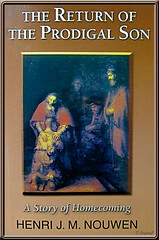 At this point, we, the retreatants, were encouraged to look intently at Rembrandt’s painting, especially the father figure which represents God, the central focus of the Parable of the Prodigal Son. 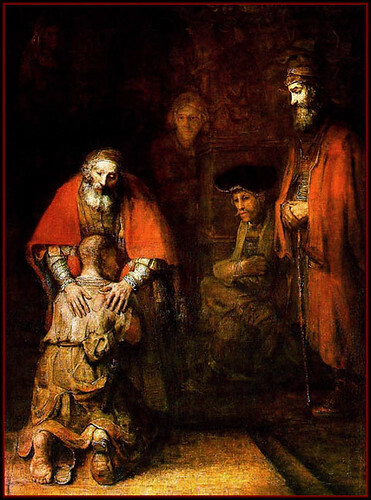 The three main characters seemingly depicted Rembrandt himself – as the brash and arrogant young nobleman on the right, as the deeply wounded son on his knees who had experienced much sorrow and pain by the deaths of his beloved ones, and as the compassionate and merciful father, a perception of his aged self who was half-blind and stooped by old age, emptied out by much sufferings and just desires to comfort, bless and give. 1. The contrast between light and darkness, and the drain separating the figures. Light and warmth radiating from the father to his sons, and darkness in varying degrees on the 2 mysterious figures in the background and on the vague outline of the woman behind the father. All these, seemingly depict that God is readily available and is seeking us out with love and inviting us to return home to Him, regardless of our sinful state. Do we want to step into His Light and choose life or prefer to stay out in the darkness and choose death. How awesome our Father God is!! 3. The father’s attire – he’s dressed in gold-embroidered garment and a deep red cloak. It’s warm colour symbolizes love and its arch-like shape depicts the sheltering wings of the mother bird for her chicks. It expresses God’s offer of care, shelter, safety and protection for us all. God’s love, care and protection is unconditional, unwavering, and inexhaustible. Every child is precious to Him regardless of our state. Can we, with complete trust, surrender our broken lives into God’s loving and merciful hands and allow The Almighty to do all the healing, restoring and renewing? Was the prodigal son ever repentant? When did he actually repent? But, so dumbfounded was he by his father’s uninhibited welcome which he least expected that the last 3rd line, ‘treat me as one of your hired workers’ was missed out. Here too, it portrays the father’s unconditional love and protective nature. A nobleman running out shamelessly to protect his ragged son, probably from the jeering crowd of friends whom he smugly shunned when he left home. Straightaway, the prodigal son was restored his sonship with the best robe, ring and shoes, and his return celebrated with a sumptuous feast. Once we’re in God’s house as His children and heirs, we are called to become like Him in love and compassion. A big challenge and difficult task, no doubt about that. But, God has sent His true and beloved Son, Jesus to become the model for our becoming like the Father. In obedience and never rebellious, Jesus became the prodigal son (left His Father’s home) for our sake, to bring home all the lost children of God by His Cross. Through Jesus and united to Him, we can become true children of God and grow to become compassionate as our heavenly Father is and love as He does. We’re to serve others with love, not as paid servants. The Prodigal Son Retreat ended with the service and veneration of the Cross. Through Bible readings from Isaiah 52:13-53:12 and Luke 23:33-56, we recall God’s unconditional love in the central event of our salvation by His beloved Son, Jesus, whose death and resurrection saved us from sin and eternal death and brought us eternal life. The veneration of the Cross and kissing the Crucifix as a sign of our acceptance of Jesus on the Cross as our Lord and Savior and our willingness to take up the cross and follow Him, was a tear-jerking finale for all of us, lost and repentant children, desiring to return home to God, our all-loving, all-compassionate and all-merciful Father. Our heartfelt thanks to our retreat directors, Most Rev. John Ha, Dr. Jeffrey Goh and Angie, for their excellent and enriching presentations. And, a round of applause too to SFA Family Life Ministry team who organized this retreat and our parish priest, Fr. Valentine Dompok who accompanied us. It was truly the most rewarding spiritual retreat I’ve ever attended, one that I wouldn’t want to miss for the world! The State Hermitage Museum of St. Petersburg, Russia, retains all rights to The Return of the Prodigal Son. I really enjoy this painting. A friend of mine had laminated a A4 size picture & gave me as a gift and explained to me about the story about this prodigal son. Few years later I received a stamp from Bulgaria picturing this exact painting. If you notice the father have lots of bangles & accessories on the right hand but very few pieces on the left? I love the painting too, James…We’re thinking of printing this magnificent image, frame and place it strategically in our home to remind us often of God’s loving invitation to return home! A friend of mine mentioned that the bangles on the left hand represent the wealth of the prodigal son which the father had kept in comparison to the full arm adornment of the elder son. The Prodigal son message have a very deep meaning and in a spiritual context – they are everlasting truth about life that we can constantly learn & ponder upon. One in particular I remember, its considered disgraceful for a man of honour to run – but when the father saw the son, he ran & hugged him. And that represent God’s love – God doesn’t wait for us and when we confess or repent, He doesn’t jab with sharp words.. Awesome painting with so much finer details to be admired and expounded, huh! It presents much to humanity, varying in perception for each individual. Similarly, the Parable – it’s message is so rich, meaningful and applicable for us as we live out our faith journey to meet God. You’ve shared well, my friend and thanks! Also, you state: “Thanks too to Paul A. Twelker who permitted download of Rembrandt’s painting from his article on Rembrandt and Psychology: …” I did not give you permission as that is beyond my ability to do so. I received permission from the State Hermitage Museum, and acknowledged this permission with the words:The State Hermitage Museum of St. Petersburg, Russia, retains all rights to The Return of the Prodigal Son. This is the only way that you can correctly note permission to use the image. Sorry for my error, Paul Twelker. Hopefully, I did it correctly this time. Appreciate your kind comments and much thanks.